One of the geological wonders of the world. Cappadocia is a high plateau in Central Turkey at an altitude of 3270 ft / 1000 m. It lies in a triangle formed by the three main towns of Kayseri, Nevsehir and Nigde. The history of Cappadocia begins 60 million years ago with the eruption of 2 volcanos, covering the area with lava and tufa. In later periods rain and wind eroded the land and created unusual valleys, canyons and cones. For many centuries Hittites, Assyrian Colonies, Greeks and Romans lived in the region. 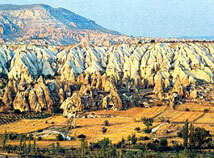 Cappadocia is also a very important region in early Christian History. There are over 600 hundred rock-cut churches built by monks and hermits between the 4th and 11th centuries. In some of these, church walls have been decorated with wonderful frescoes depicting scenes from the Bible.